During commercial breaks last night in the devastating and almost unfathomable defeat of my beloved Philadelphia Phillies, viewers were treated to repeated views of the trailer for an upcoming remake of The Three Musketeers. Nothing special. It looks like a typical, stylized, action-packed remake. It apparently includes the customary nod to feminism (a swashbuckling French maiden), and lots of witty banter by debonair and handsome heroes. Who knows — it may be good. But what occurred to me is the strangeness of the term musketeer. I assumed a musketeer is a soldier who fights with a musket. My requisite Googling confirmed my assumption. 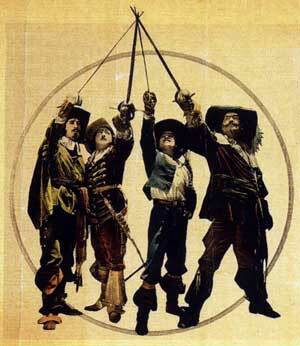 So why, I wonder, are the Three Musketeers never portrayed with muskets? They are rapier-wielding swordsman. Always. And why are there always four of them? Somebody explain to me why the story is not known as The Four Swordsman. Also, the story is about D’Artagnon, and his adventures, and his life was markedly changed by the 3 Musketeers who were already a known group of 3 friends called the “Inseperables” by their fellow Musketeers. D’Artagnon was in the guard throughout most of the story and it isn’t until the end that his dream to become a Musketeer is realized. Les Mousquetaires du Roi were formed in 1622 under Louis XIII. Its main function was to form the King’s bodyguard in peacetime. Its members were all of noble ancestry, and mostly aged between 17 and 20. In time of war, the regiment fought with the army, either infantry or cavalry. They were at first armed with that new invention, the flintlock musket. However, these early muskets were up to 8 feet long and weighed about 20 pounds. This was useless to cavalry, and not much use for an elite corps of infantry expected to charge at the run – especially as they would also have to carry a forked stick on which to rest the thing while firing. The muskets, therefore, did not last long; but the name remained. I have just read the book, and it’s a fantastic read. They do use guns in the book, usually pistols though. This seems to have been placed during an era where people were transitioning from swords to guns as the convenience of the newer invention was refined. Because D’Artangan was accepted into the musketeers when there was already 3 , Porthos Athos and Aramis. why they were considered musketeers i do not know. Okay, but after he was accepted, there were four. How hard would it have been to change the name to the Four Musketeers? Maybe it was too much trouble to get a new logo, business cards, domain name, etc. For the record, I have NOT read the book.